Dr George Thomas Has done Post graduation in Marketing Management (MMM) and M.Phil in Management from Alagappa University. Obtained U.S.A. degree in MBA, DCA from UWCTC Bangalore and Ph.D in management. He was senior executive in various capacities for fifteen years, spread over multinationals such as Almintak Estd. Saudi Arabia/S Hercules Engg. Industries (P) Ltd. in Middle East and India. Has a decade and half of exclusive academic experience which includes : Principal of T John College Bangalore, Shri Siddhartha Institute of Management Studies Tumkur and Dean of KIIT School of Management, KIIT University Bangalore. 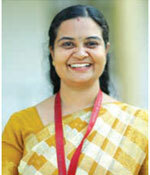 Director Ahalia School of Mgmt, Palakkad, and Dean of Albertian Institute of Mgmt, Ernakulum. Visiting Professor to nine Universities several prestigious Business Schools. He has participated in many national and international seminars by presenting papers in Management, CRM, Marketing, and Foreign Trade etc. few of which has won awards. B.Tech (Honours), MBA Professor Samuel Thomas is a B.Tech (Honours) first class in Mechanical Engineering from IIT Kharagpur and MBA from Simon Business School, University of Rochester with specialization in finance. He has 20 years industrial experience mainly in the Steel Industry and Automobile Industry and He retired from SAIL from the Top Management position of General Manager. Professor Thomas has also got 21 years’ experience in Teaching in reputed institutions such as XLRI Jamshedpur, XIME Bangalore, Management Training Institute (SAIL) Ranchi etc. He is one of the few distinguished Indian to find mention in Marquis ‘Who’s Who in the World’ for his achievement and distinction in the chosen field of endeavour. He has published two books and 5 papers in reputed journals. BA, MA, M.Phil, PhD Dr. Jalaja N R holds a BA and MA Degree in Economics from M G University. She took her M.Phil from the Department of Applied Economics, CUSAT. She has also awarded her Doctorate in 2004 from the Department of Applied Economics, Cochin University of Science and Technology. 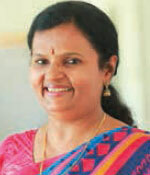 She has published papers in reputed journals and has participated in both National and International Conferences. She has attended numerous Workshops and Faculty Development Programmes. She handles Research Methodology, Business Statistics, Marketing Research, Marketing of Financial Services, International Financial Management and Managerial Economics papers. 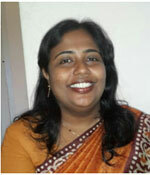 saginithomasmathai@sngist.org MA, MBA, M.Phil, Ph.D Dr.Sagini Thomas Mathai holds an M.Phil degree from Alagappa University and MA from Kerala University. She holds an MBA degree in Marketing. She also holds a Diploma in Journalism, a Diploma in Travel and Tourism and Post Graduate Diploma in Human Resource Management. She has more than ten years of teaching experience handling Managerial Communication, Marketing Management, Retail Management, Services Marketing, Integrated Marketing Communication, Brand Management and Counseling Skills for Managers papers etc. She had a fruitful career in the industry spanning more than eight years having worked for reputed companies like Tata Sky, Satyam Infoway, Bharatmatrimony.com etc. She has published numerous articles in International and National journals and has also attended numerous Conferences, Seminars and Workshops. 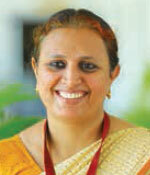 LLB, MBA, PhD Dr.Bindi K R holds an LLB from Calicut University , an MBA in HR. She has more than 5 years of experience in the High court of Kerala as a practicing advocate and around eleven years of management teaching experience. She has also shown her administrative acumen while working at Infra Housing Pvt. Ltd. She has presented papers in various National Seminars and her articles have been published in reputed National and International Journals .She is an active participant in Workshops and Conferences conducted by KMA, NIPM and reputed Organizations .She handles Legal Environment of Business, Human Resource Management, Managing Interpersonal and Group Processes, Industrial Relations, Indian Ethos and Values, Management Information Systems, Managerial Communication ,Marketing Research, Corporate Laws, Principles of Management, Brand Management, Organizational Behaviour and Environment Management papers. B.Sc, M.Sc, MBA, SET Ms. Giselle George., MBA, M.Sc. B.Ed., SET, She holds Bachelor degrees in Science and Education and post graduation in Mathematics and Business Administration. She successfully completed SET in Mathematics and presently undergoing her Ph.D., in Management at BSMED, Bharathiar University (UGC Centre of Excellence) under the regular scheme. She is a Certified ISO 9001:2008 Lead Auditor certified by IRCA, London. She is the Federal Bank HormisTharakan Fullbright scholar for her MBA covering a scholarship of one lakhs during the year 2011 and 2012. International / National Conferences: Ms. Giselle George has attended three conferences abroad in Switzerland, Malaysia and India. She has presented two papers in international conferences at Malaysia and India. Ms. Giselle George has published four papers in peer reviewed high impact factor journals of national and international prominence. She has total eight years of experience in Teaching, Training and Certification Industry. MBA, PGDHRM, BA, Ph.D (Pursuing) Ms. Nitha Unnikrishnan C holds an MBA in Finance, HR from Adi Sankara Institute of Engineering and Technology. 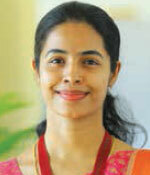 She is currently pursuing her Research in management at Bharathiar University. She has completed her bachelor’s Degree in English Language and Literature and holds an additional Post Graduate Diploma in Human resource Management. She has more than four years of teaching experience and handles both Finance and HR subjects. She brings with her more than 3 years of experience of managing leading corporate entities like VOLVO, Spectrum Soft Tech Solutions, etc. She is a member of placement team of FMS , SNGIST and has been active in the field of training students in Soft Skills .She has published articles in reputed National and International journals and has attended numerous Faculty Development Programmes, Conferences, Seminars and Workshops. M.Com, M.A., PGDM, PGDFM, UGC-NET, PhD(Pursuing) He has 1 year industry experience as Procurement Manager at Eurotech International Ltd. 2 years research experience as JRF and 3 years research experience as SRF at CUSAT. 3 years teaching experience as Visiting Faculty of commerce at ICT. He has 8 international publications and 7 national publications to his credit in peer reviewed standard Journals. 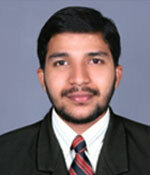 Dr.Vinosh Peter K.V., is an Associate Professor in our Institute. He currently handles management papers including Integrated Marketing & Business and society. He has over eleven years of teaching experience. Coming to his academic achievements, He has completed his MBA from Karunya Institute of Science and Technology, Anna University, apart from being a post graduate in Economics under the University of Calicut. 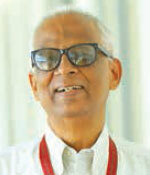 He has completed Ph.D from Bharathiyar University after attaining an M.Phil Degree from the same University. He has published a number of articles in journals and has presented papers in international and national conferences conducted by various management Institutions. His area of interest is Marketing and Business Economics.